"Heliospectra’s Plant Lab and Light experts have over a decade of experience researching how individual colors of light, or spectra of light, influence various growth and flowering responses. By combining this extensive knowledge and programmable LED lighting solutions to guide plant growth and development, we help empower growers to maximize their growth potential", the team with the company explains. In order to study the growth response of tomato in a seedling stage, Heliospectra’s Plant Lab and light experts investigated the effects a far-red enriched spectrum can have on seedling production of tomatoes. "The research below, will familiarize commercial tomato growers; especially those using controlled environments, with how to control stem height and thickness in tomato seedlings", the company says. "The research was carried out in Heliospectra’s in-house Plant Lab on seedlings of tomato rootstock cultivar; Kaiser and Emperador. The seedlings were germinated under the Heliospectra light bar, then moved into grow chambers for experimental light treatment and cultivated under the fully adjustable spectrum LED grow light ELIXIA" the team with the company explains. a FR- enriched spectrum; a third light treatment adding FR only as a 30-minute end-of-day (EOD) treatment. The company points out that plant morphology too was monitored, such as color, stem height, and diameter. Further, electricity consumption was measured for each lighting strategy, and recorded in kilowatts per hour (kWh). Alos, the company explains that "the initial plant height was measured at the start of the light treatments and then recorded throughout the experiment. At the end of the experiment, after 15-18 days of treatment, the stem diameter was measured. The experiment was repeated three times." According to the team with the company, tomato seedlings grown with FR were taller and had larger leaves compared to seedlings grown without far-red which were shorter with a darker leaf color. "Tomato seedlings which had been exposed to the EOD FR treatment showed the greatest difference. They were taller, almost 15% taller than plants grown under no far red (Kaiser 14.7%, Emperador 14.9%), and had larger leaves than plants grown under a FR-enriched spectrum. The FR-enriched spectrum still showed a significant increase in height of 11.6% (Kaiser) and 12.4% (Emperador)." "The FR in the light treatments also had an impact on the stem diameter. Seedlings grown under far red showed a 3.3% (Kaiser) and 3.5% (Emperador) thicker stem than seedlings grown without FR. Further the seedlings treated with EOD FR had a thicker and taller stem than those grown with a FR enriched spectrum, resulting in an increase of 3.6% (Kaiser) and 3.8% (Emperador) in diameter compared to crops grown without far-red." Light is a powerful tool in order to influence crop morphology, biomass and overall quality. Finally, the company concludes, "The results from this test indicates that differences in growth performance should be expected as an outcome of applying different light strategies. 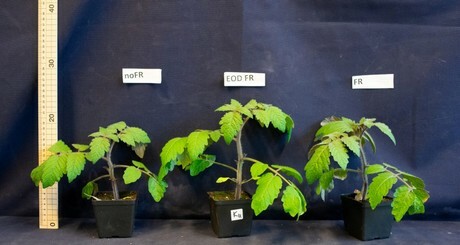 If a grower’s goal is to achieve extensive growth of a tomato seedling, then far-red can be utilized to reach that goal. If the goal is to produce more compact seedlings, far-red should be excluded." "Furthermore, by adding FR only at the end of the day, growers can reduce energy consumption using smart LED lighting systems to achieve energy efficiency and non-chemical control of plant morphology." According to the company, "By deploying Heliospectra’s helioCORE control software’s Scheduling module, growers can use different lighting strategies to influence the growth of a tomato seedling, like an EOD treatment. Providing intelligent LED lighting solutions, a potential advantage over traditional non-flexible HPS or HID lighting applications." The company recommends, "Growers with the goal to graft tomatoes should consider incorporating far–red treatments into their lighting strategies, as the ability to obtain thicker stems could benefit the process significant." This research was presented by Heliospectra’s Plant and Light Solution Expert Ida Fällström as a research poster at the National Conference of the Canadian Society for Horticultural Science on October 4th, 2018 in Niagara Falls, Ontario.